» Bike-share debacle isn’t unique to Baltimore. Thefts, other woes had also hit the early programs in N.Y., Paris. Bike-share debacle isn’t unique to Baltimore. Thefts, other woes had also hit the early programs in N.Y., Paris. 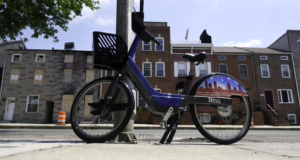 Last fall, then-Mayor Stephanie Rawlings-Blake touted Baltimore’s new bike-rental system as a sign of the city’s progress. By summer, most of the 25 bike stations scattered around the city’s downtown and tourist areas were empty. Many of the 230 bikes were unaccounted for. Others had been found badly battered. About 100 bikes were in the shop on a given day in August, so many that keeping up with repairs was impossible. So the city chose to shut down the program, work on a solution, and possibly start over. If Baltimore takes the right steps, experts say, this rough start will go down in history as merely a temporary setback — one that many other cities have overcome — although few have been forced to take as drastic measures as Charm City and shut down.